Because it’s a hotel, Jedediah Hawkins Inn is perfect for a relaxing weekend away for guests. By renting all six rooms located on the property, you’ll be able to rent out the Inn for the weekend. Host an intimate rehearsal dinner in the stunning solarium, walk underneath the arbor as it doubles as your ceremony’s aisle, and dance the night away in their barn complete with a wisteria backdrop. Your guests will be thanking you later, with all of the Inn's amazing menu and dining options offered. Salt Air Farm is the ideal venue to make your dream of a garden party wedding a reality. Situated on the North Fork of Long Island, the farm is noted for growing a variety of flowers and fruits throughout the property. Your backdrop for the big day will consist of fragrant wildflowers, hydrangeas, and peach and nectarine trees during the height of summer and early fall. Add a tent on the large lawn complete with chairs and an aisle for your ceremony for a picture perfect farm setting. With a stunning barn located on the property and some of the most captivating ocean views on Long Island, Driftwood Farms is one of the most fabulous locations in Orient Point. Couples can opt for a tented reception overlooking the ocean, but the barn is equally as stunning and just as elegant. Guests will be surrounded by the luxurious, lush grounds and beautiful horse stables. Old Bethpage Village Restoration is the home of the annual Long Island Fair. The Barn is a much more modern replica of the building that once served as the Fair’s main hub. Today it features each and every modern convenience and can accommodate up to 300 guests. 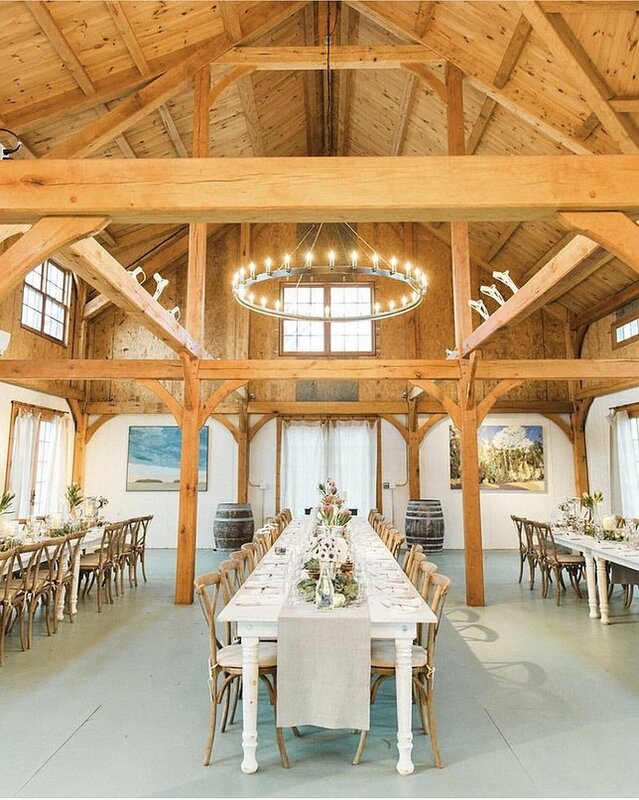 The barn boasts stunning high ceilings and exposed wood beams, with food on-site and the opportunity to use their event planning company for seamless planning. Located on Long Island’s eastern end along the river, Peconic River Herb Farm is an ideal 14 acre location if you’re searching for rustic gardens and greenhouses, patios and sprawling lawns with stunning riverfront views. Their tent area is also available to rent as well as their greenhouse for smaller gatherings. The farm gladly supports other Long Island farms, wineries, brewers, musicians, distillers and caterers. Be sure to ask them for their list of recommendations. A total of 72 acres of orchards surround Breeze Hill Farm, plus there’s a private beach on the premises for the perfect backdrop for pictures. With such a stunning location, it comes as no surprise that their barn is just as beautiful, featuring classic shingles and rustic wood beams combined with an inviting stone fireplace. Host your ceremony on the beautiful grounds, move inside the barn for your reception, and close out the night on the romantic patio. Castello di Borghese is the oldest vineyard on Long Island. Established by a prince and princess and still maintained by their children, the winery specializes in delicious Italian wines. With the barn doubling as a gallery, Castello di Borghese is a stunning location for an elegant reception with rustic, Italian flair. Their land is also equipped for large tents too. Hallockville is a unique natural staging area for your big day, boasting 500 acres of farmland and open space. The beautifully restored barn provides indoor space for a cocktail party, band, and a night of dancing and celebrating. The open beams and warm woods of the barn's interior are a couple’s dream. Although the space has a true rustic vibe, you’ll be able to transform the barn into just about anything. If a tent if also needed, the venue can situate a natural opening between the two structures. Guests will enjoy the amazing grounds filled with historic buildings dating back to 1937. Subject: LongIsland.com - Your Name sent you Article details of "These Eight Long Island Venues are the Perfect Rustic Backdrop for Your Wedding Day"